One addition I would make is mentioning not only the weekly quests in Wintergrasp (AKA WG) but also in Tol Barad (AKA TB). While one of the quests (Horde: L’arrêt du siège | Alliance: L’arrêt du siège) is usually impossible to complete, the others give 150 to 225 honor (depending on guild level) atop what the battlegrounds themselves give you. The battlegrounds themselves grant roughly 200 to 400 honor, depending on bases controlled and, obviously, victory vs. loss, for usually no more than 15 minutes of faux-PvP, depending on your realm. For example, on a PvP realm such as Sargeras-US, where the Alliance to Horde ratio is very high, no Hordie in his right mind is going to queue for TB or WG, and if he does, he'll run away when he realizes he's outnumbered 5 to 1. However, from what I have seen, this is not the same experience of a PvE realm, such as Zul'jin-US, regardless of faction control. Do you get the underdog faction more often? Yes. Is it a threat? Not usually. It's kind of ironic to think that there is more PvP activity on the PvE servers, but it's what I have seen across roughly 4 unique servers now. To stick more to my point, WG and TB are both really effective for gaining honor, and I think, even though this guide is clearly more focused on PvE gear/methods of obtaining PvE gear, the fastest way to get a decent ilvl is getting the ilvl522 PvP gear and going from there. On most faction-dominated servers, it's less PvP and more PvE anyway! Winning or controlling WG also grants you access to VoA (Caveau d’Archavon), which, if done on 25 man difficulty alone, can grant about 1000 additional honor a week. As an example, doing TB, WG, VoA, IoT dailies, and GH dailies, I had 3.5k honor the day I dinged 90 on my newest DK. Yes, VoA is really hard to solo on a boosted 90, I know. It's possible for most tank and pet classes though. I speak from firsthand and secondhand experience on this. It can't hurt to try. 10 man difficulty also grants honor, albeit significantly less. Don't get discouraged if you can't solo Toravon. First time I soloed him on 25 man difficulty was on an ilevel522 Warlock. TL;DR: do Tol Barad and Wintergrasp along with Vault of Archavon atop the other honor dailies and you can get geared out in full ilvl522 gear really quickly, or even just replace that ilvl496 ring you've been stuck with for a while. I boosted my character to 90 and when i wanted teleport to Uldum i didnt found teleports in the city.For the easier game in future i would recomment to do start quests at the Uldum,Twilight Highlands etc. Another two items critical to gearing up are the crafted iLevel 553 belts and pants. I was able to gear up to iLevel 527 in just over a week averaging just three hours a day by chain running dungeons and exploiting Tol Barad and Wintergrasp. When I was done 12 items were PvP 522, 1 valor point purchased iLevel 522 amulet from the Shado-Pan Assault, and the 2 553 crafted items as mentioned above (fully upgrading the pants in the process to 569). I've updated this for 6.0.2, updates include mentioning the Blasted Lands questline for abilities, vendors that sell epics for gold, links to beginner class guides, removing the legendary cape and solo fun content sections, linking to the new boosted gear. A very nice guide for those that have just boosted. Very helpful if you've just returned to the game before WoD gets here. You no longer get a mail from Rhonin, and the mail from Lorewalker Cho no longer contains fireworks, he just asks you to see him at the Seat of Knowledge. Warforged Seals are no longer limited weekly. You can now buy as many as you want up to the limit of 20. Again, Warforged Seals are no longer limited weekly. I know most people will find this post of mine unnecessary, but to those who are reading this guide after recently returning back to WoW and don't understand or have never experienced Draenor, when they speak of SMV, and other areas that you may remember from Outland, Draenor is pretty much Outland in a difference time period. Draenor has places that are still/were in Outland. Just giving a heads up as quite a few people have been very confused by this. Hope this helps someone! IIRC - you get 300 GRs, not 350 GRs. It is worth noting that currently a player has to complete the quests to set up their base in Tanaan before the Lumbermill unlocks. This also applies to the random npc quest, the poster for the Nagrand quest and possibly others. After I had completed that I could go through the 3 quests from Justin Timberlord and Khadger's servant appeared with a quest also. Kudos to CM Hagut for pointing me in the right direction on that one. I just rolled a heap of Baleful Tokens since the 6.2.3 patch and thought people might appreciate statistics on upgrade chance. 95 total BOE armour tokens. does this boost comes with profession boost as well? if so. what level do you need to upgrade your professins as well? Is it possible to complete the story quests with a level boosted character? It seeming not at the moment as it auto completed "into anguish" and I have no way of getting "The dark side of the moon"
I got a letter in the mail to go see Loremaster Cho, but there is no portal in SW open to me. Not about to do a lvl 90 quest chain to open the portal, so I can only assume what he wanted wasn't very important or Blizz would have given us a portal. Thought I'd mention it, as I was looking to see if anyone else has had the same problem. Seems to be a bug for boosted mages - not just don't get portals - CAN NOT learn them when visiting portal trainers. Might want to to add a note to the profession listings that says: You can sell shoulder enchants and leg kits for older expansions, these are not available in WoD. I really hope someone can help me- because this is highly annoying. I boosted a char, but I can't upgrade my buildings to lvl 2... I want the storehouse to be lvl 2 , and even tho I have the plans it says in the garrison builder thingie that I don't have the required plans. What's up with that? It's like that with several buildings. Note that many if not the majority of the existing comments on this page to-date were apparently posted when this was a guide about boosting a toon to 90, and are now out-of-date. As usual, Wowhead provides more information about a character service than Blizzard. Thanks Wowhead for always providing the information that I need. Boosted characters are unable to enter dungeons and raids from previous expansions for 24 hours. A little personal observation, before this mandatory waiting time, I was able to enter old raids from Vanilla, BC and WotLK but not from Cata and MoP. I didn't try WoD because it was irrevelant at my gear level to even thinking solo it. On the other hand, I wasn't able to enter any dungeon whatsoever. My wife just used her Legion pre-purchase boost on a brand new priest (level 1, no professions). Garrison included a Tailoring Emporium, which we assumed was because that's a "traditional" profession for a clothie. Can anyone confirm the profession building is in fact random and not class-based? So just to clear something up with a friend... you get absolutely no bonus profession experience from boosting a new character? I see u get ember silk bags. but what if u already have larger bags? ie hex weave. how does it work do they get placed in new bags or what? thx. It should be noted that the character boost completely wipes your questlog. Don't be an idiot like me who found the original Vials of Eternity quest in an old toon's log, used the boost to solo the bosses to get the title, only to find out that it was wiped from the log. GMs won't do anything because there was no record of which quests got wiped, and their records don't go back far enough to prove I picked up the original quest. So I'm SOL. Out the boost and out the title. It seems like boosted characters get all flight path unlocked on broken isles. Ok, I need an honest opinion. with the way legion proffs work, is it really even worth getting to 60 for the profession boost? I am currently in a new ish guild so not many people have proffs but I cant decide if grinding to 60 is worth the hastle. "The quests in Draenor ARE available. You can even do the intro scenario. I tried it myself. I went through the dark portal in blasted lands and when I came out I was standing in Tanaan Jungle with Kadghar in front of me with the quest to start the invasion. The cut scene for creating your garrison isn't there however because you already have a level 3 garrison. All the quests are available for you to do and you can do them in any order. You can start with Nagrand quests if you like for example. I would recommend doing them since they do give a good amount of gold plus you pick up extra followers." I have yet to try this myself, but I will do so and get back with an edit. If this is true, then it's possible the only a handful of directive quests (those sending you to the Dark Portal in the first place) will be unavailable for boosted characters. "You should be able to do the Warlords of Draenor opening by travelling to Blasted Lands and heading through the Dark Portal into Tanaan Jungle. This will allow you to play through the WoD introduction just as you desire. You will still have a Garrison built up to level 3, but not all of the garisson will be active until you've completed the full introduction to Tanaan, culminating in the quest where you assemble the Garrison." So that's another confirmation that most of the quest line is still obtainable, even after a lvl 100 boost. You just need to run around a bit to actually find them. Okay, so I've run through the questline on two chars since I last posted. The first was a lvl 85 that I got up to 90. The second was my boosted lvl 100. For both chars, the pre-WoD content in Blasted Lands was still available. Might be worth noting that for my leveled char, the board offered the quest The Dark Portal which wasn't available for my boosted char. Click the link for more information. Accepting The Dark Portal invalidates the Blasted Lands pre-Draenor content, so I took the portal to Blasted Lands, and spoke to Thrall. I took the quests Attack of the Iron Horde and Under Siege of him, then got Peeking into the Portal of the troll, since the initial breadcrumb quest, Iron Horde Invasion - is no longer obtainable. The Blasted Lands questline progresses without issue, directing you back to Orgrimmar when completed. The Dark Portal isn't available for boosted chars, so I took the portal to Blasted Lands, and did the pre-Draenor content as above. When I handed in the final quest in Orgrimmar, I headed back to the portal, and walked on through. This spawned my char at the initial stage of Draenor Introduction quests, and Khadghar offered up the same quest as for my leveled char. According to Support, once you have completed the questline for Tanaan Jungle upto establishing your outpost all the locked features in your garrsion will unlock. Although the quest Den of Wolves, the breadcrumb leading to Wor'gol has been completed, the next quest in the chain, Rally the Frostwolves has not. You can pick up your Frostfire Ridge questline from there. An incredibly well done listing. For me though, the biggest problem is to decide what class to boost. I want to get a Druid and Shaman to max, but it's so hard to decide since the preview feels so limiting. Patch 7.2.5. For level 100 boosted character, If you don't have any quest after completing Demons Among Us and spoke with Illidari in mage quarter. Try log out then log back in. In the Blink of an Eye should show up then. Had me panicking for a while. Cheers for the hard work you put into the guides! So I should take the time to go to Draenor and complete the quests there, or should I keep pushing forward with the Legion Content? Just wondering, because my character is only 101 and I did not play the previous expansions. One thing not mentioned, your toolbars will be wiped out, settings reset, talent points reset, and anything that you unlocked at 60 will be removed. on my rogue at 60 I unlocked Leeching Poison, post boost its gone, along with most of the contents of my tool bars. also, I was tossed directly into the broken isles combat zone with no way to fight and nothing in my bags. basicly, dont use the boost. it $%^&s over your toon and makes it impossible to play it for hours on end. As of BFA there is no longer any professions Veteran bonus for characters above a certain level. I've just just had this confirmed by Blizzard Support. I had both 100 and 110 boosts. I used a 100 boost today 12/1/18. 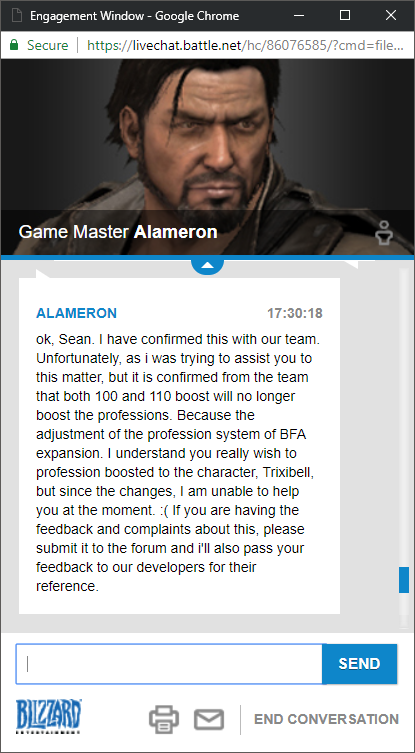 you can not use a 100 boost on a trial character. I did get bags, 500 gold and some food also was mailed 137 gear for other specs. the stuff I was carrying and my gear was mailed back to me. did not get any garrison anything. my talents were set to the first selection down the line.